"BPA- and phthalate-free...skip the warm water trick and get your popsicle loose by simply peeling away the silicone mold." "Holds four 1-ounce popsicles that each sit on a looped handle shaped perfectly for small fingers." "Topped with a blue plastic lid that has slots to insert the wooden popsicle sticks (which are included)." "Each pack comes with 36 fillable and sealable tubes that you can use to craft delicious popsicles at home." "Require a smaller footprint in your freezer and allow you to pile frozen food on top of them." "Drips collect at the bottom of the cone." "More than 1,300 people have given them a five-star rating on Amazon." Most popsicle molds are made of plastic, which may make you wonder if harmful chemicals could be leeching into your favorite frozen treats. This BPA- and phthalate-free mold from Zoku makes sure you know exactly what goes into your pops—just fresh, wholesome ingredients from your kitchen. With this one, you can also skip the warm water trick and get your popsicle loose by simply peeling away the silicone mold. Once you’re finished eating, simply hand wash the molds in the sink with some soap and water. Each mold holds 3.5 fluid ounces and creates a popsicle with a fun, rounded shape. The included sticks are topped with drip guards to keep your hands clean on a warm day. Toddlers love popsicles, but their little hands have a tough time gripping the top-heavy stick. 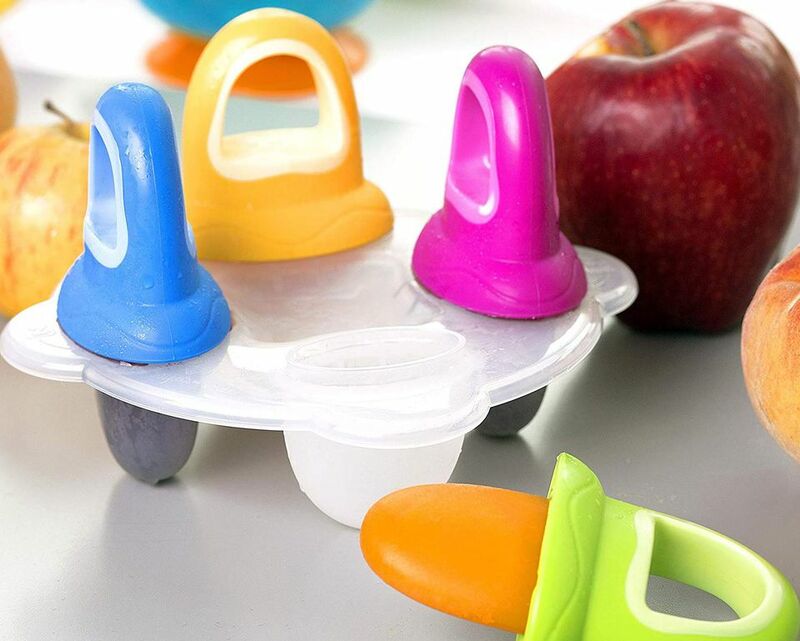 Avoid the tears that will inevitably come when the popsicle is dropped into the dirt by getting these kid-friendly molds from Nuby. The Garden Fresh Fruitsicle tray holds four 1-ounce popsicles that each sit on a looped handle shaped perfectly for small fingers. All you have to do is spoon fresh fruit and vegetable juices or purees straight into the wells to create healthy treats the whole family will love. These molds are great for soothing teething babies and making electrolyte pops for sick kids. This budget-friendly mold creates that classic popsicle shape you expect to get from the grocery store or an ice cream truck. The Norpro name is one you can trust in the kitchen, too. The mold freezes a batch of ten 3-ounce ice pops in about five hours. Just pour in your favorite juice, puree, pudding or yogurt—or use a combination of ingredients—to get stunning popsicles that are good for you, too. The mold gets topped with a blue plastic lid that has slots to insert the wooden popsicle sticks (which are included). The lid is specifically designed to hold the sticks straight to make sure the popsicle is secure. Plus, using disposable materials means you don't have to round up a bunch of used plastic handles once everyone's done eating. Remember Otter Pops and Fla-Vor-Ice? They're those neon-colored popsicle tubes that come filled with a fruit-flavored liquid. The liquid is a mixture of artificial dyes, fruit juice, high fructose corn syrup, and preservatives. While tasty, they're hardly healthy. If you want to make an icy treat that's a little more natural, get these Zipzicle Zip-Top Ice Pop Pouches. Each pack comes with 36 fillable and sealable tubes that you can use to craft delicious popsicles at home. Zipzicles were originally created because the founders' son was allergic to artificial food dyes and couldn't eat commercially available pops. Now, you can benefit by helping you and your kids avoid artificial ingredients, too. They're the perfect option for a quick treat at a party or anytime the kids invite friends over. One of the downsides to owning a traditional popsicle mold is how much valuable freezer real estate it takes up. Since the sticks point straight up, you can’t place anything else on top. Lekue Stackable Popsicle Molds solve your space issues. The four colorful molds lay flat and fit together to stack vertically. They require a smaller footprint in your freezer and allow you to pile frozen food on top of them. The flexible molds are made of BPA-free silicone and hold 2 ounces of liquid. To fill them, just open the lid—this also protects against freezer odors—and pour in a fruity puree. These molds are much easier to use because you fill them from the side, not the top like classic molds. The set comes with easy popsicle recipe ideas, including gluten- and lactose-free options. Eating a popsicle is a race against the clock (and the heat) to make sure the whole thing isn’t dripping down your arm in five minutes. And, if kids are involved, you should definitely expect to have a sugary mess on your hands. Luckily, kids can take advantage of the HIC Flavor Blast Ice Pop Maker‘s unique shape to squeeze out only the top of the popsicle. Instead of sticky fingers, the drips collect at the bottom of the cone. The 8-inch molds are simple to fill and get topped with a secure cap so they can lie flat in the freezer. It’s easy to take out just one or two at a time when the kids need a cold treat. These reusable popsicle molds from Ozera make things easy. They don’t cost a lot, the design allows you to grab one pop at a time, and they come with their own brush and funnel. More than 1,300 people have given them a five-star rating on Amazon, where reviewers aren’t afraid to be brutally honest if something has flaws. The clear molds sit on a detachable base during the freezing process, but they can be removed to be stored flat once they’re frozen. The molds’ tops have BPA-free plastic sticks with drip guards to keep your clothes stain free. As an extra bonus, the entire set can go straight into the dishwasher once it’s empty. You don’t have to try hard to convince kids to eat a popsicle during the summer. Yet, Tovolo's dino-shaped molds make the whole experience a little more fun. The popsicles’ handles match up perfectly to the four mold shapes and act as each dinosaur’s tail. As the kids eat the pops, hidden fossils are revealed in the center. The set includes a base tray designed to fit in a freezer door or stack on top of other storage. The tray holds the silicone molds vertically and makes it easy to take them out one at a time.